If someone is wheezing, has difficulty breathing, or has a fast heart rate after an insect bite phone 111 straight away and ask for an ambulance. Then follow the instructions for anaphylaxis. Humans and animals carry a lot of germs (bacteria) in their mouths, so both human and animal bites can be quite dangerous. It's important to clean them. How can I help someone who's been bitten? If the person is bleeding heavily, stop the bleeding by applying direct pressure with a clean, dry cloth until it stops. If possible, wear gloves. If there are bits of teeth in the wound EITHER remove them if you can do so easily OR if that's not possible, don't apply pressure directly where the teeth are. Once the wound has stopped bleeding, rinse it under running water and clean it using soap and water. Pat it dry. Cover it with a non-stick dressing or bandage. Use over-the-counter pain relief such as paracetamol or ibuprofen if necessary. Follow the instructions on the packet. 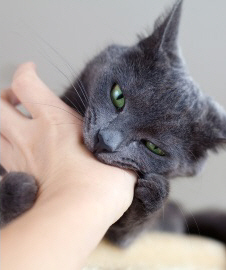 Human and animal bites have a high chance ot getting infected, even if the wounds look quite small. In most cases it's best to see a GP to check if the person who's been bitten needs antibiotics. If a finger, ear, or other body part has been bitten off, wash it in tap water and wrap it in a clean cloth or tissue. Put it in a plastic bag and surround it in ice. Take the person and the body part to the Emergency Department. there is stiffness or a lack of movement around the wound. You should also see your general practice team if you're not sure if your (or the injured person's) tetanus vaccine is up to date. Insect bites are very common. They often cause redness, swelling, and itching around them. Very rarely a person can have a severe allergic reaction to an insect bite and will need urgent medical help. For a bee sting, immediately remove the sting by brushing, plucking, or flicking it off. This stops more venom being injected. How can I help someone who's been bitten or stung? Apply a cold compress – this can be ice wrapped in a cloth, or a cloth dipped in cold water. This will help to reduce pain and swelling. Watch the person to see if they are showing any signs of severe allergic reaction, such as difficulty breathing, a spreading rash, or collapse. If any of these happen phone 111 for an ambulance straight away. If the person usually has swelling and reactions to insect bites, it's a good idea for them to take antihistamines for a few days. St John has good, clear advice about how to treat an insect bite. More information about which insects bite or sting, what the effects may be, how to treat them, and how to avoid them.